5 July 2013, Singapore –Race promoter Singapore GP Pte Ltd today announced that Singapore Telecommunications Limited (SingTel) has extended its partnership with Formula 1® to be the Title Sponsor for the 2013 FORMULA 1 SINGAPORE GRAND PRIX. As part of the agreement, SingTel have also secured options to renew the title sponsorship until 2017. 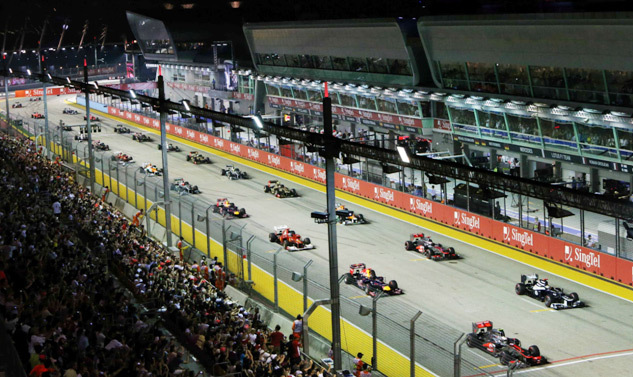 Since the inaugural night race in 2008, SingTel have helped shape the FORMULA 1 SINGAPORE GRAND PRIX into one of the must-attend events on the motorsports calendar. Much of the success of the first five years could not have been possible without their invaluable support. As one of Singapore’s most iconic brands, SingTel has been a fantastic fit for the world’s only Formula 1® night race. Their unsurpassed reach in Singapore, outreach programmes like last year’s “F1® for Everyone” campaign, as well as various platforms such as telecommunication services, mio TV and multimedia products have touch points with nearly every Singapore resident, enabling fans to get even closer to the Formula 1® action. Off the track, SingTel has also been an excellent partner, offering innovative technological solutions and services around the Circuit Park. Patrons at the 2013 FORMULA 1 SINGTEL SINGAPORE GRAND PRIX can also look forward to yet another spectacular fireworks display on 22 September at the Marina Bay Street Circuit, courtesy of SingTel. One of the roles as Title Sponsor is to commission the winner's trophy. This year, SingTel has engaged a Singapore company, RISIS, to design an elegant trophy inspired by the Singapore skyline. The trophy, when viewed from the top, captures the actual shape of the track.